When the doors to the truck were opened, Sissy started to back out. However, her insecurity and fear of humans delayed her coming out of the trailer for almost an hour. Several times she started backing out and changed her mind. Then she was finally ready, Sissy stepped out of the trailer. The abuse she had been through was evident by the way she feared everything. 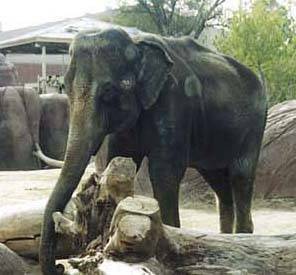 Barbara, the elephant, was the first elephant let into Sissy's stall (the others were all outside playing). Every time Barbara went near Sissy, Sissy turned her back. This is the way elephants who are afraid protect themselves. Barbara was being so sweet and gentle and kept trying to caress Sissy. Eventually (after about 2 hours), Sissy allowed Barbara to touch her face--a gesture that says "I'm your friend and won't hurt you." At about 4:00, the other elephants were allowed in the barn to meet their new friend. As the four elephants walked into the barn and smelled Sissy, the trumpets and grumbles filled the air. The 4 elephants were separated from Sissy by an entire stall (so not to scare Sissy). Three of the elephants (Jenny, Shirley and Bunny) were so anxious to meet Sissy that Carol (Director of the Sanctuary) opened the gate allowing them to be closer (but still separated by bars). The next picture was adorable. Three trunks were sticking out through the bars trying desperately to touch Sissy! But, Sissy kept her distance by at least 20 feet. After a very short time, Sissy backed up to the bars to allow the 3 elephants to sniff her. The next hour was purely magical. They were all touching, sniffing, communicating and reassuring Sissy.